I came across this post by Beata Ryta in which she shows off her Easter Joy cards. As you can guess from the name, they were created by her to give to friends and family for Easter and her hope was, of course, that they would bring joy to the recipients. Looking at her beautiful cards, I’m sure any receiving one would have felt very special to have had such a lovely card made for them. 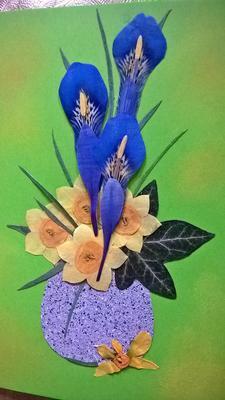 The cards have been made using pressed spring flowers such as narcissi and irises. These have worked really well in the flower vase design used by Beata and are just like receiving a bunch of flowers – except they last much longer! By using pressed flowers Beata has created a pleasing 3D effect, and the use of spring flowers gives the cards a proper Easter seasonal feel to them. Beata’s page on her Easter Joy cards can be found by following this link. For different more Easter card inspiration have a look at our Easter Crafts page.